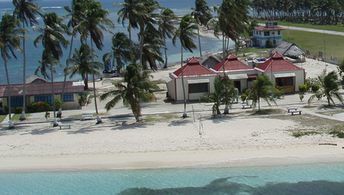 This beach ranks #7 of the "Best beaches in San Blas islands"
In the island of El Porvenir, typical hotels rooms' rates are about $400 per night. However, cheaper options are also available. In many cases, this price includes fullboard meal plan and trips to the neighboring islands. Fly to Panama City international airport (PTY). Next fly to the island of El Porvenir. There are also many boat trip options from the mainland to San Blas. It is very popular to take boat tour hopping around San Blas islands departing from the Colombian Cartagena. It is better to choose large boat with many good user's reviews. The best time for a holiday in the San Blas Islands of Panama is a dry season from late December to April.